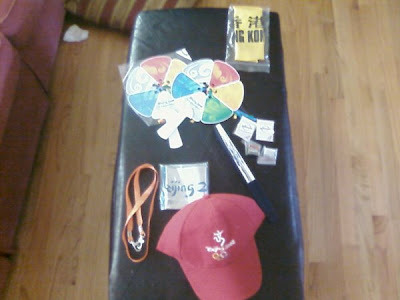 There's some neat stuff there, including a swim cap that Michael got from a Hong Kong swimmer (they exchange caps the way soccer players exchange jerseys), some Olympics pins and a lanyard that Michael used for his credentials. Elle loved all of it...heck, we all did. Beth and I stayed up all hours of the night watching Michael win his medals. And to have something like this come in the mail was just amazing. Suffice it to say, Elle has a new favorite athlete (sorry, David Ortiz). And she wears the baseball cap all over the house yelling "I'm an Olympian!!" This was made possible by Marissa Gagnon, a Saco resident who works for the Michael Phelps Foundation. So thank you to Marissa for doing this. 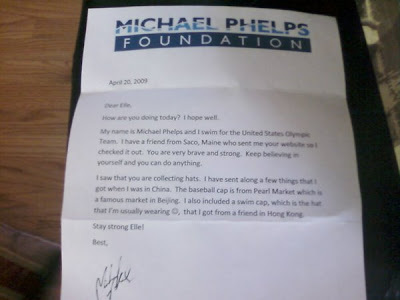 And thank you to Michael Phelps as well for taking the time out of his busy, busy schedule to do this for Elle. It was incredibly kind of both of you to put this together. Wonderful. Just plain wonderful. I have a whole new level of respect for Mr. Phelps. 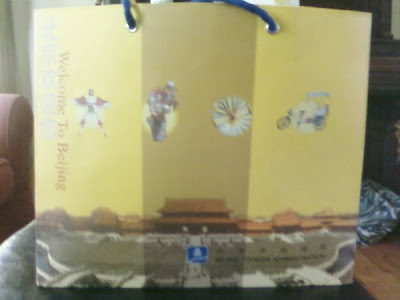 Wow, that is awsome! Elle is going to be famous. I have a new favorite athlete too. That was awesome! what did you guys do with the weed he sent? Sorry! Didn't mean to harsh your mellow. Very nice, Dave. My prayers are with you and your family. Incredibly thoughtful! Wasn't Phelps on the "Bong Show?"